Saint Helena Road in the Christian Quarter in the walled city of Jerusalem. Main entrance to the Church of the Holy Sepulchre (left) and Mosque of Omar (right) from the Saint Helena Road. The Church of the Sepulchre is weaved in to the surroundig architecture so much that it is virtually invisible from anywhere, and cannot be seen from the street levels. The Saint Helen Road in Jerusalem is one of the two streets leading to the Church of the Holy Sepulchre. 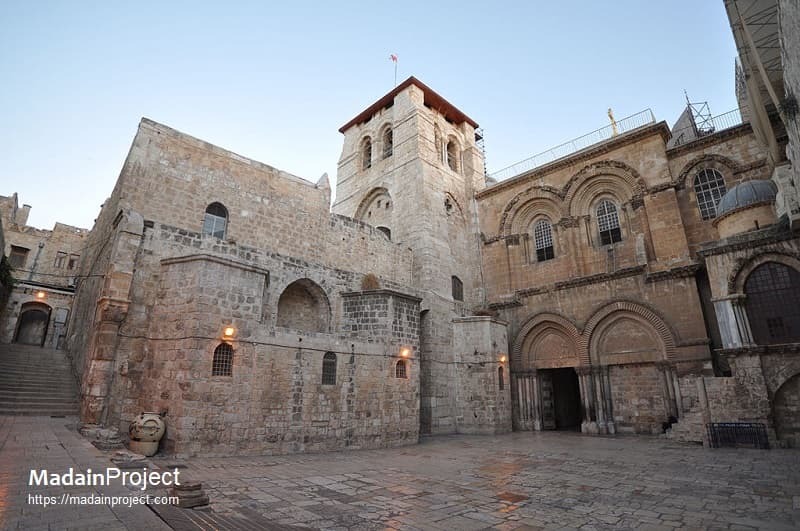 It allows access to the basilica from the Christian Quarter, one can see the beautifully adorned entrance to the Omar's mosque at the end of the street where it turns left and ends at the door of Holy Sepulchre. The Church of the Holy Sepulchre courtyard as seen after entering from Souq al-Dabbagh, the stairs to the left lead to the Saint Helena road. To the right is the Chapel of the Franks (10th station of Via Dolorosa). The church contains, according to traditions dating back to at least the fourth century, the two holiest sites in Christianity: the site where Jesus of Nazareth was crucified, at a place known as "Calvary" or "Golgotha". Mosque of Omer, as seen from the courtyard of Church of Holy Sepulchre, Jerusalem. The Mosque of Omar was built in its current shape by the Ayyubid Sultan al-Afdal ibn Salah ad-Din in 1193 in memory of this event. The Ayyubid Mosque of Omar (Arabic: مسجد عمر بن الخطاب‎, Hebrew: מסגד עומר‎) in Jerusalem is located opposite the southern courtyard of the Church of the Holy Sepulchre in the Muristan area of the Christian Quarter. The building exterior is not visible from any of the streets, only the entrance and minaret is visable. The saint Helena road ends inside the Church of the Sepulcher at the Calvary or Golgotha, where Jesus is believed to have been crucified in biblical tradition. It meets the Via Dolorosa at Via Dolorosa inscription under the Arch of Ecce Homo (originally built by Hadrian in 135 CE). The processional was is called by several names, most commonly known naes are "Way of Grief," "Way of Sorrow," "Way of Suffering" or simply "Painful Way". The following enlists the stations of the current Via Dolorosa, in sequence. Jacobs, D. (1999). Jerusalem: The mini rough guide. London: Rough guides. Janin, H. (2002). Four paths to Jerusalem: Jewish, Christian, Muslim, and secular pilgrimages, 1000 BCE to 2001 CE. Jefferson, NC: McFarland &. Janin, H. (2005). The pursuit of learning in the Islamic world, 610-2003. Jefferson, NC: McFarland.